BERKELEY — Howard A. Bern, professor emeritus of integrative biology at the University of California, Berkeley, and a pioneer in understanding how hormones affect development, including that of the human fetus, died Jan. 3 at his home in Berkeley after a nine-month battle with cancer. He was 91. Howard A. Bern, courtesy of Alan Bern. Bern was an endocrinologist whose research in the 1960s on diethylstilbestrol (DES), a synthetic hormone given to women to prevent premature birth, helped scientists understand its role in causing cancer. 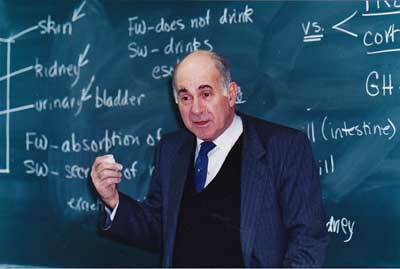 He was co-author of the standard book on the developmental effects of DES during pregnancy. Today, chemicals that affect hormones – so-called endocrine disruptors – are a major concern because of their prevalence in the environment. Bern and Aubrey Gorbman, a former zoology professor and department chairman at the University of Washington, co-authored the defining text in the field, “A Textbook of Comparative Endocrinology,” in 1962. That book “contained concepts that were key to the development of the emerging field of comparative endocrinology and guided the thinking and careers of a vast number of scientists around the world,” Sower said. Bern’s later work, some of it conducted at the Bodega Marine Laboratory, looked at the effects of hormonal changes in salmon and striped bass as they move from fresh to salt water. He discovered previously unsuspected hormone systems in these fish, and demonstrated the broad evolutionary significance of pituitary hormones such as prolactin. In recognition of his pioneering work, the Society of Integrative and Comparative Biology inaugurated the Howard A. Bern Distinguished Lecture in Comparative Endocrinology in 2001. Bern’s son Alan said his father’s greatest commitment was to the development of his students. He was particularly committed to student diversity, supporting not only underrepresented minorities, but students from diverse countries, as well as students arrested for their political activity in the Free Speech Movement. “He taught me that one’s legacy to science is not the work that you do, but the people you leave behind,” wrote University of Florida zoologist Louis Guillette, a protégé of Bern’s. Bern was always proud of the fact that he was nominated for the National Science Foundation Presidential Mentoring Award in 2005. Bern was born in Montreal, Canada, on Jan. 30, 1920, and moved with his family to Los Angeles in 1933, during the Depression, where at the age of 14 he became the family’s primary breadwinner. He received his B.A. in 1941 and his Ph.D. in 1948 from UCLA, interrupted by four years of service in the military during World War II. He joined the UC Berkeley Department of Zoology in 1948 as an instructor, became an assistant professor in 1950, and retired in 1990 with the Berkeley Citation, the campus’s highest honor for a faculty member. He authored or co-authored 600 scientific papers, co-edited seven books, supervised more than 46 Ph.D. students, 36 master’s degree students and thousands of undergraduates, and mentored more than 90 postdoctoral fellows and visiting professors. Bern was honored with UC Berkeley’s Distinguished Teaching Award in 1972 and was a member of the National Academy of Sciences and a fellow of the California Academy of Sciences. He also was a member of the American Academy of Arts and Sciences; American Association for the Advancement of Sciences; Indian National Science Academy; National Society of Science, Arts, and Letters of Naples, Italy; and Accademia Nazionale dei Lincei in Italy. He received numerous honorary doctorates from universities around the world. He is survived by his wife of 65 years, Estelle; sister, Judy Brooker of Palm Springs, Calif.; brother, Gordon Bern of Laguna Hills, Calif.; two children, Lauren Bern of Madison, Wisc., and Alan Bern of Berkeley; six grandchildren and two great grandchildren. Plans are underway for a memorial later this year. Donations may be made in Bern’s memory to Doctors without Borders (212-763-5779).